Most budget-minded North American retirees assume Europe is too expensive. Not so, concludes a new report from the editors at InternationalLiving.com, which identifies locations offering good-value, low-cost lifestyles rich with Old World charm and culture. Rich in history and culture, Europe has long held strong appeal for North American retirees. Rich in history and culture, Europe has long held strong appeal for North American retirees. But many people who would love to retire to the Old World assume it’s beyond their budget. Not so, concludes a new report from the retire-overseas experts at InternationalLiving.com. While Europe on the whole is typically more expensive than Latin America or Asia, there are many European destinations where expat retirees can enjoy a genuinely affordable retirement on a budget (for a couple) of as little as $1,650 a month—the Old-World romance and charm come free. The island nation of Malta, in the heart of the Mediterranean, has much to offer expats. The English-speaking population—a legacy of British colonization—makes it easy for North Americans to adjust to life here. The islands benefit from warm weather year round. The healthcare system is among the best in the world. 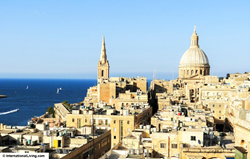 And although tiny, the Maltese islands still offer diversity; you can enjoy a switched-on, urban lifestyle in the capital, Valletta, or rustic, country living close to the sea on Gozo. And it’s affordable, with many expats living on $1,800 to $2,400 per month, all expenses included. In Portugal, you can enjoy a low cost of living similar to that in Latin America’s more developed countries with all the benefits of European life thrown in. As in many Latin countries, lunch is generally a proper meal in Portugal, and two courses with a beverage can be had from about $10. A glass of wine in many restaurants goes for $4. International Living Editor, Glynna Prentice, has described the capital, Lisbon, as the most affordable capital in Western Europe. Being neighbors, Portugal and Spain share a friendly rivalry and like to emphasize the differences between them. But one thing they have in common is affordability. Rents in Altea range from around $350 to $380 a month for a nice one-bedroom apartment or studio, and around $435-plus for a large three-bedroom apartment. A single person can comfortably live on $1,100 a month or a couple on around $1,650, which includes rent, food, utilities, public transport, and entertainment. This low-cost life isn’t exclusive to small-town Spain. In the city of Valencia, for instance, rents can be found for under $600 a month. Nestled between the Pyrenees and Cévennes mountain ranges and the sparkling waters of the Mediterranean, the Languedoc region offers some of the most diverse and intense landscapes in France. With around 300 days of sunshine a year and short, mild winters, the Languedoc attracts thousands of expats. The biggest hub for expats is Montpellier, the Languedoc’s historic capital. This fast-growing university town is ideal for anyone seeking a bubbling cultural scene and easy access to a variety of great restaurants, boutiques, and bars. The white-sand beaches of the Mediterranean are only a 45-minute tram/bus ride from the town center. The Languedoc housing prices are a bit higher than other areas in France, but there are still bargains to be found. In a pretty village 15 minutes from the town of Pézenas—and an hour’s drive from the sea—a three-bedroom, 1,100-square-foot townhouse is on offer for $205,000. The fishing town of Banyuls-sur-Mer has a fully renovated two-bedroom village house of 721 square feet on the market for $172,900. There are other destinations in Europe that have Old World charm at affordable prices as well. Many of them fit the requirements of budget-minded North American retirees without sacrificing quality of life or access to Europe’s diverse and historic culture. The full report can be read here: "The Most Affordable Retirement Havens in Western Europe." For information about InternationalLiving.com content republishing, available source material or to book an interview for radio, TV or print with one of our experts, contact Associate Editor Carol Barron, 772-678-0287 (US), CBarron@InternationalLiving.com or visit the Media Center.